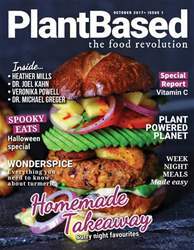 Welcome to the first ever issue of Plant Based magazine! The times are changing and this is perhaps the most exciting time for the vegan movement that we’ve ever seen. You may be questioning why it is, therefore, that the title of this magazine has changed from Cook Vegan to PlantBased.